Generally, developers create applications from the Portal. You can also create applications from the Dashboard to grant additional access to developers. 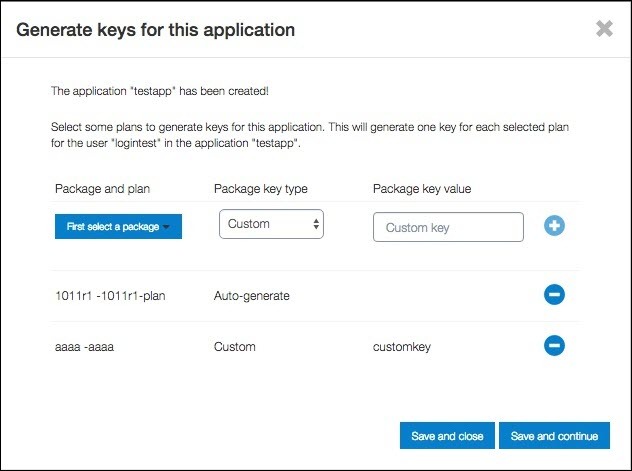 To generate Package Keys for a user, an application should be created for that user, if the user does not have one, or if the applications already have the maximum allowed set of Package Keys. On the Applications page, click New Application. The New Application pop-up window is displayed. On the New Application page, enter the following details. The user who owns the application. Click Save and close to finish creating the application for the user. Or, click Save and continue to save the application, and open the Generate keys for this application pop-up window, where you can select a package and plan for the application, as well as create the keys for the same application. In the Generate keys for this application pop-up window, use the drop-down lists to select a Package and plan and Package key type, then specify a Package key value. Then, click Save and close. Note: If the Custom option is selected, use the Package key value field to provide a value for key. If Auto-generate option is selected, the key value will be automatically generated.